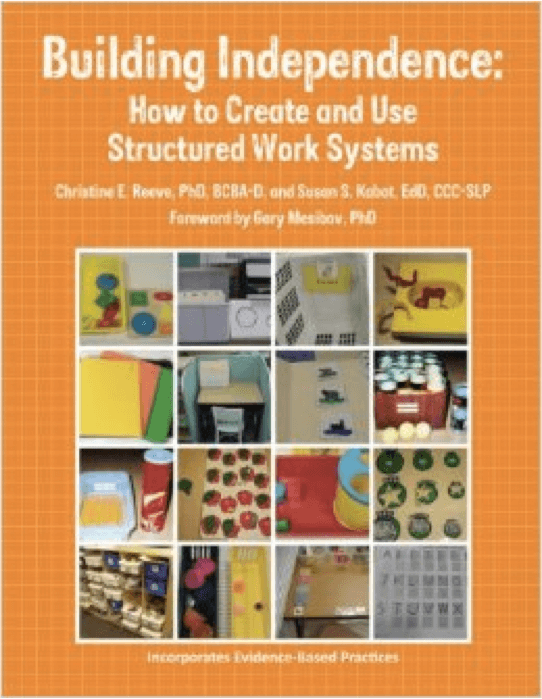 If you've followed the last tutorials, you have what you need for independent work and you set up the structure of your independent work system. But we still don't have work in our system for the students to complete. That's today. Over the years, I've seen LOTS of work systems. And with the introduction of Pinterest and the internet, there are lots of examples out there of "work tasks" or "work boxes." I just want to tell you that not all "work tasks" are equal and not all "work boxes" are ready for an independent work system. Here's why. Remember at the beginning of this series, I told you that there is a reason behind each element of a work system? There is a reason behind each of these characteristics as well, and I'll try to make them clear as I walk you through them. This one is definitely the primary issue you want to be sure of when choosing tasks for independent work. Think about it....if you haven't mastered a task, you still need to help to complete it. If you still need help, how will you do it independently? I know when I say it that way, it seems obvious. However, I often find that people easily forget this one. Make sure that each one of your tasks has been mastered in a direct instruction setting. Independent work is a GREAT opportunity for the student to practice to maintain their skills. ​​So, you thought the work task was independent before you put it in independent work, but the student is struggling with the task? Chances are good that it was mastered in a certain situation, but the student didn't generalize. 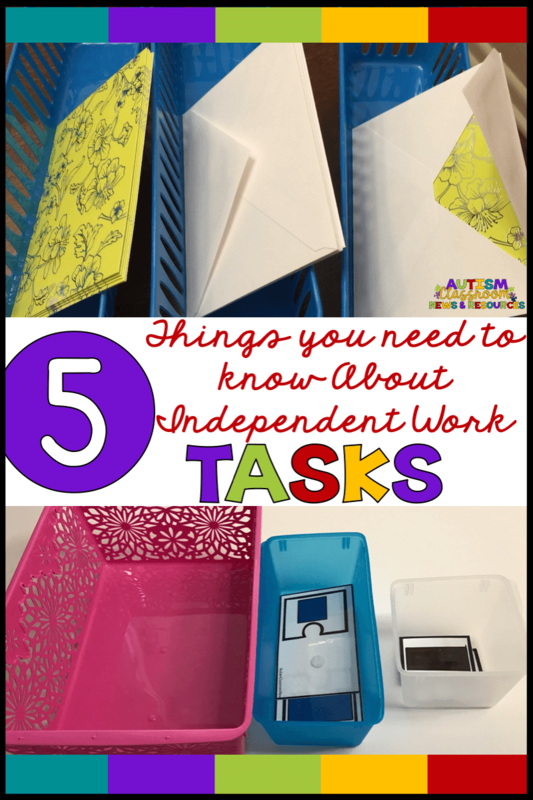 You want to make sure that, if a student is struggling with or just learning the independent work system, it's not because the task is something he can't do. So, consider making the tasks easier than something the student could do in a 1-1 instruction setting when you are just getting started. Remember question # 3 in the 4 questions that every work system should answer? The student needs to know when he or she is finished with the task. If you choose a task, like reading in a chapter book, how does the student know to stop? In order to complete the task and move on (as we would with a job), the beginning and end of the task need to be clear. Remember that the crux of the independent work system relies on its visual nature. 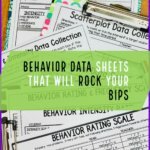 You are depending on students gaining information from the way the task is laid out. Consequently knowing how to start and when to move on is important to complete the other items on the work task list. I want the student to be doing more than just file folder and boxed tasks. What about using real-life jobs that are not so self-contained? Now, not all tasks have to be tasks that go in a basket or have Velcro. Some tasks may not look like they have a clear beginning and end at first. But with a little additional visual supports they can be. One example might be digging in the garden. 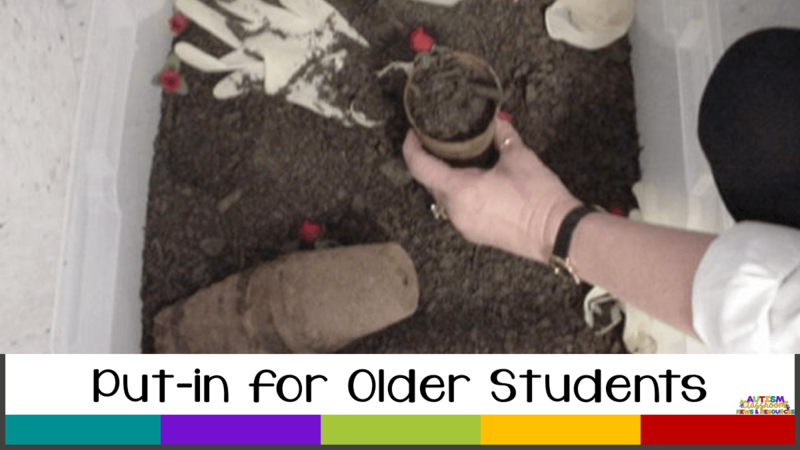 How much should the student dig? Give them a container to fill so they can see when its empty I start, and when it's full I stop. Or if they are filling pots, like the picture below, give them a set number of pots to fill. In another instance, you could have a task in the work system to wash the table. Knowing when the table is completely clean might be difficult. But you could make it easier by adding 3 pieces of masking tape to map out areas of the table to clean. Then teach the student to wipe the table from the left section to the right section. Since the student is supposed to know when the task is finished, you want to avoid giving confusing visual cues, like extra pieces. Think about it...if you are putting together a piece of "easy to assemble" furniture...how do you feel if you get it assembled but you still have extra pieces? You probably think you might have missed something? Spend some time checking it over to make sure? I would (maybe it's just my OCD). 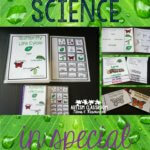 The same is true when a student is doing a file folder game and there are extra pieces in the box. 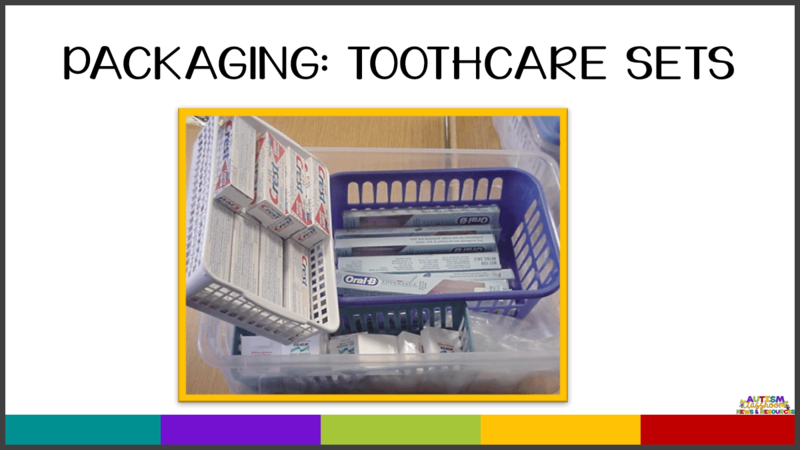 Or when they are packaging a task like the tooth care packages above and there are extras of some items, like extra toothpaste. What do they do with them? Did they mess up some of the packages and leave something out? So they go back and check...and back and forth and they don't know when they are finished. This one is a little more complicated. 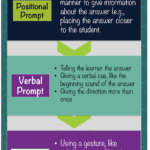 One of the elements of making a task visibly clear for the students is to help them know how to complete the task. Many of our students have difficulty with executive functioning skills. 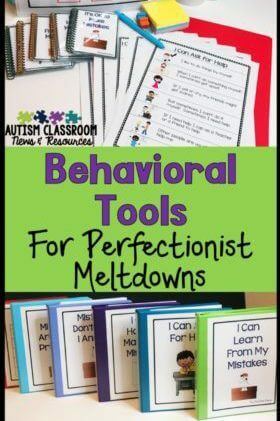 This makes it difficult for them to know how to organize tasks when given a pile of material. You can help them with this by organizing the task within the task like the ones below. You don't have to set it out for them, but by putting items in separate bins, you can teach them to lay them out for themselves. And finally, this one goes back to allowing the system to answer the question, "How do I know when I'm finished?" I've talked about this one before, but it bears repeating. You want the student to put the work away completed. You don't want them to clean it up when they are done by taking it apart. Why? A few reasons. First, it's kind of demoralizing to put time and effort into doing something and someone tells you to undo your work. 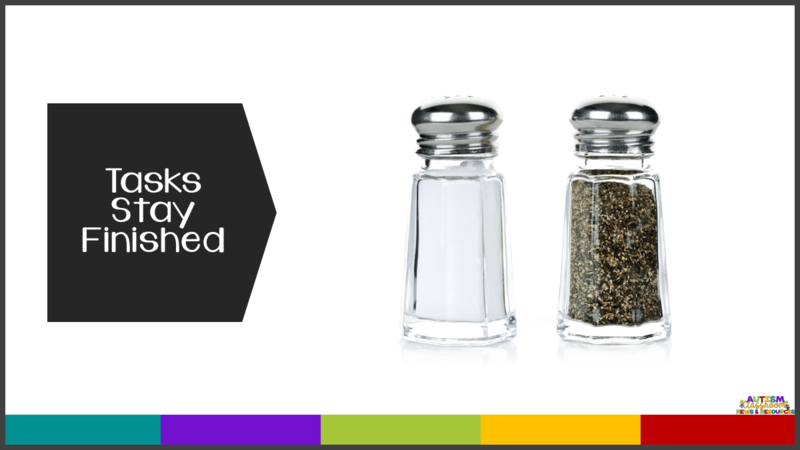 Second, would you ask a worker in a restaurant to fill up the salt shakers and then empty them again? Similarly, you wouldn't ask a student to do his math work and then erase all the answers. Remember that we are using work systems to help our students be successful in school and work situations, so work completion is important. Along the same lines you don't want the work to fall apart when the student goes to put it away. I once watched a student put a file folder together, put it away in the finished basket. It fell apart (because it didn't have Velcro on the pieces). He picked it up and redid it. Went to put it in the finished basket and it fell apart again. He did this three or four times before I stepped in or he would have kept going. 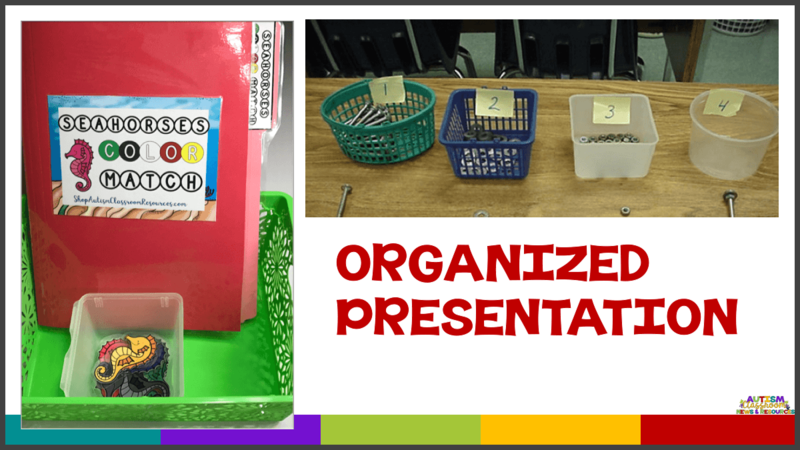 So, use Velcro, paperclips, and other ways to keep tasks assembled and completed when the student puts it away. That way he'll be putting away a completed product. Would you want your "easy to assemble" furniture to come apart once you finish putting it together? This post contains affiliate links for purchases. I only recommend resources I use myself. The price is the same to you, but it gives me a small commission to keep finding them for you. I'll be back with some more examples of tasks in the next post. In the meantime, if you are looking for task examples, check out the series of Workbasket Wednesday posts. You might also want to check out our book on Building Independence (affiliate link).